My first earthquake was the Loma Prieta earthquake on October 17, 1989. The 6.9 magnitude earthquake is also known as the World Series Quake because millions saw the earthquake live on TV as they watched Game 3 at Candlestick Park. The epicenter of the earthquake was located about 10 miles northeast of Santa Cruz on the Loma Prieta segment of the San Andreas fault system. I was on a commuter bus in Berkeley at the time; I didn’t feel a thing. But, many other people did. More than 200 buildings were damaged in San Francisco’s Marina District. Forty-two people died when the upper level Cypress Street off-ramp of the Nimitz Freeway collapsed into the lower dock. Hundreds of Oakland residents were displaced when the buildings they lived in or worked in were closed because of structural damage. Earthquakes are destructive. They cause property damage, injuries and loss of life. But, we can also learn a lot from earthquakes. Earthquakes are caused by the interactions of tectonic plates. They generally occur at the boundaries where two or more plates meet. 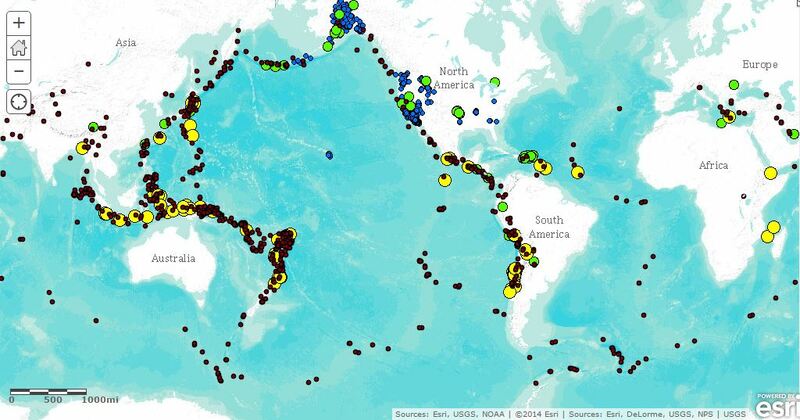 We can identify plate boundaries by mapping large amounts of earthquakes. 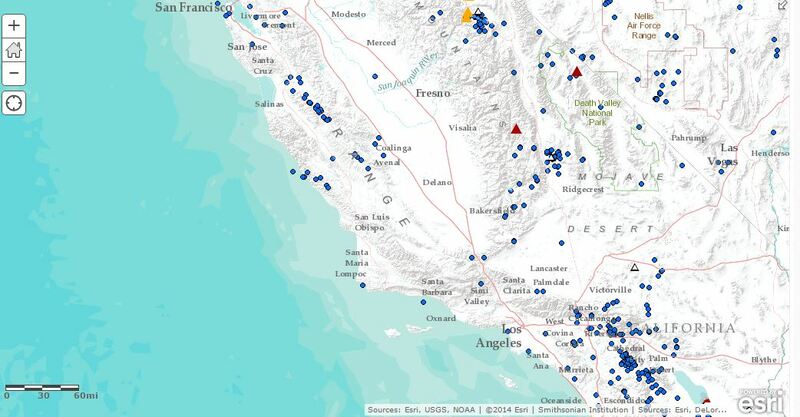 In this map, strong earthquakes from 2012-2014 are shown in red. Earthquakes from the last week are also shown. You can see that most earthquakes occur in distinct bands. These bands outline the boundaries of Earth’s tectonic plates. The discovery that earthquakes occur in bands actually contributed to the idea of plate tectonics. My students learn that there are three types of plate boundaries: divergent boundaries where plates move apart and new crust is formed; convergent boundaries where plates move together and oceanic crust is subducted or pushed down into the mantle; and, transform boundaries where plates move past each other. We can use earthquakes and volcanoes to determine the type of boundary at a map location. When I added the Smithsonian Institutions Holocene volcanoes layer to the map, it looks like this. The yellow volcanoes are volcanoes that have been active over the last 10,000 years. 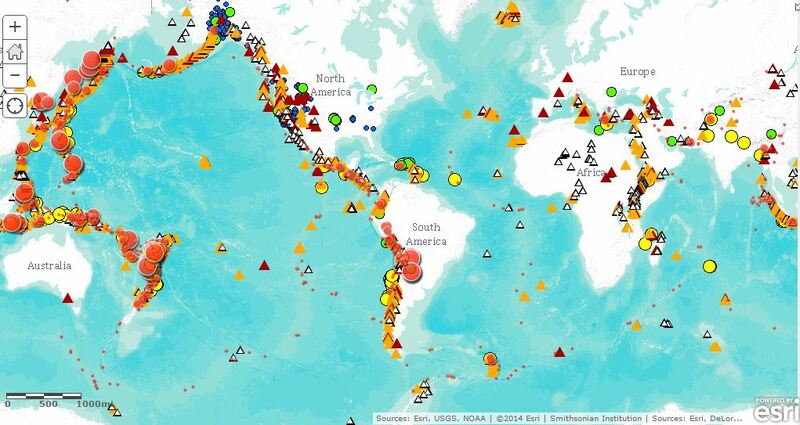 As you can see, most of these volcanoes occur in the same area as earthquakes. There are some exceptions. Volcanoes that occur far from plate boundaries are “hot spot” volcanoes. These form when crust travels over a mantle plume, an area in the mantle that is extra hot. 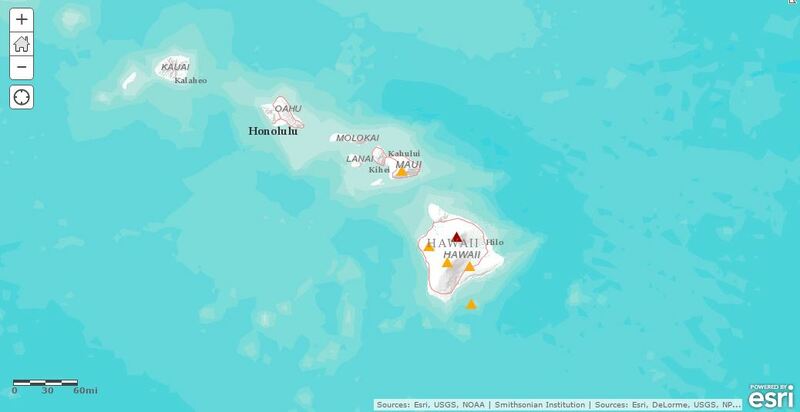 Hawaii is a chain of hot spot volcanoes. There are also places where there are earthquakes an no volcanoes. The coast of California is one of those places. In California, the San Andreas fault marks a transform boundary where the Pacific Plate is moving past the North American plate. Volcanoes only occur at divergent and convergent boundaries. The volcanoes to the east are extinct leftovers from Basin-Range rifting (divergent boundary). 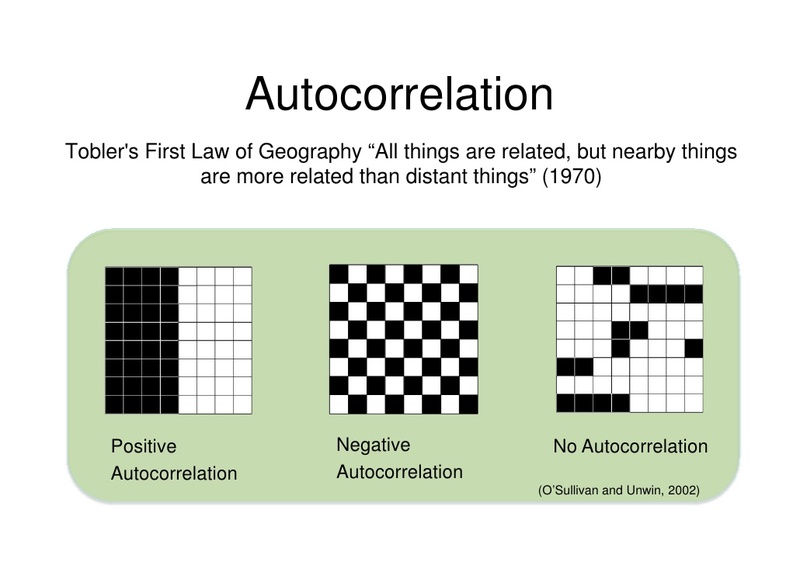 We can use earthquake depth to determine if a map boundary is convergent or divergent. In this map, depth is shown by the size of the circle. Deeper earthquakes appear larger. Shallow earthquakes (less than 75 km deep) often occur at mid-ocean ridges. These are long chains of underwater volcanoes where tectonic plates move apart and new crust is formed. 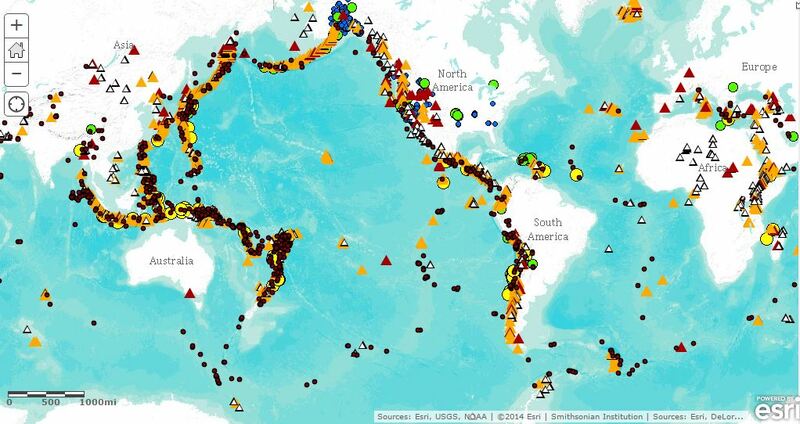 Deep earthquakes occur at subduction zones where oceanic crust is being pushed under continental crust. When this occurs, the subducting plate bumps and scrapes against the overriding plate. This causes deep earthquakes. When the subducting material reaches a depth of about 660 km, the rock becomes soft enough to flow and earthquakes stop. Non-map images are from Creative Commons (Wikipedia). My map can be found here.